Gorakhpur is a fast growing, highly populous city, bordering the country of Nepal.It has many uniqueness to its credit. Firstly it can boast to have the longest railway platform of the world.It has world famous Geeta Press Gorakhpur,which publishes highest number of religious books in the world. Thirdly teracotta earthenware potteries of this place are famous world over. It is also Buddhist circuits transit station, having a very good Buddha museum.Buddha’s birth place Lumbini, is at a distance of 90 Kms, Buddha left his body at Kushinagar, which is at a distance of 51 Kms from here.Famous Sarnath, where Buddha gave his first sermon, is about 200 Kms from this city . Another unique thing and pride of this city is that Head priest of famous Gorakhnath temple of Sri Yogi Aditynath ji is the chief Minister of UP state. Social,Cultural Identity and Trade fair of the City. It’s really a good piece of information for new bloggers .It is a sort of base guidelines.Rest one can personalize it, according to his taste and lifestyle.I think one should be honest in his efforts. No matter what kind of blog you publish, you’re sharing some information about yourself. Yet even if you write a purely personal blog or are completely comfortable peppering posts with details about your life, you may want to shield some things from the internet’s prying eyes. We often encourage you to use social networks and other online tools to help grow your blog — it’s a key part of growing traffic, and it brings in motivating feedback — but not every online space you frequent has to be connected to your blog. It’s time to think critically about managing your online identity. is a better way to feel the spirit and pulse of the Ghat. 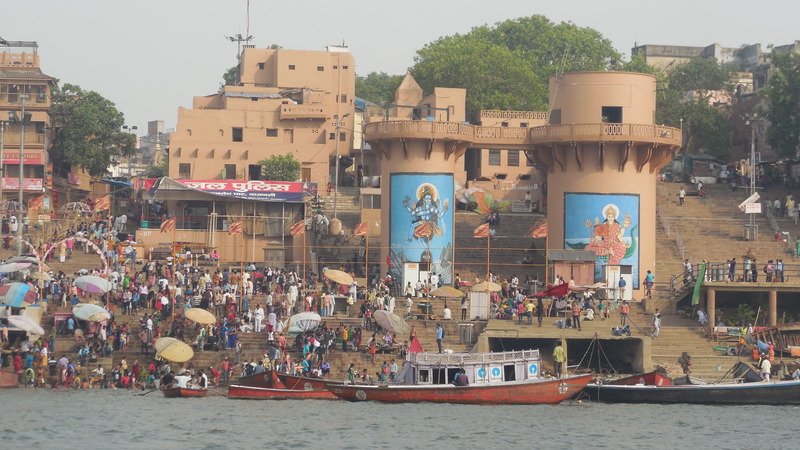 You may also take a boat ride to have panoramic view of these Ghats. It is something like you are moving a Kaleidoscope in your hand and scenario is changing, every minute, from one Ghat to another. Look below towards river, look above and watch the unique architectures of the buildings, temples, some having palatial look, each have its own history and mythology related with it.These Ghats were built and inhabited by various dynasties and monasteries and rich men’s, in due course of time span. Ghat,s of Varanasi have different meaning for different group of people’s . 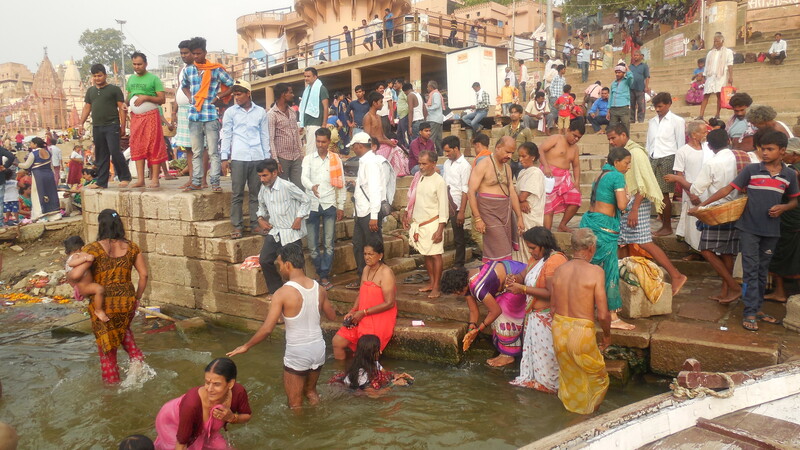 FOR LOCAL PEOPLE –These Ghats are their life line. Their daily routine starts by taking dip in the holy river Ganga. In facts their life begins at this place and their last eternal rites are also performed at this place, whether Child birth, marriage or any other celebrations, they come here every time . 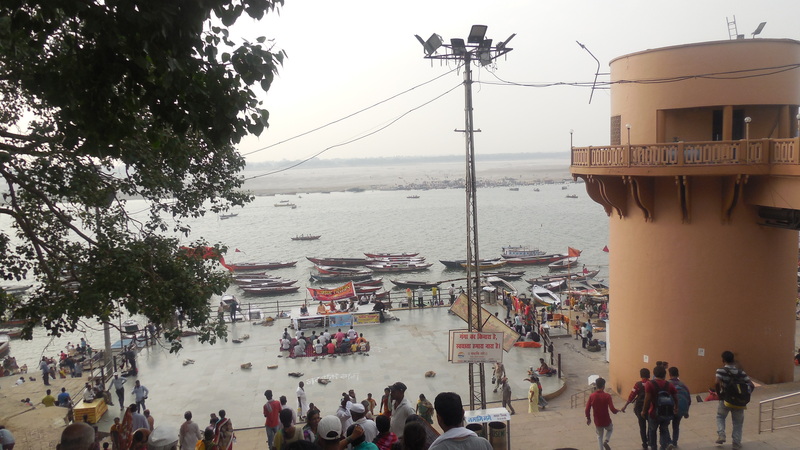 FOR TOURISTS OF INDIA AND PILIGRIMS-It’s a place to take holy dip in the river Ganga, to absolve all their sins, then enjoy its ambiance and boat ride on the river. FOR FOREIGN TOURISTS-My suggestion to them is, that if you really want to enjoy these Ghats, please give some rest to your brain .Don’t criticize, analyze or compare, just be an onlooker and try to feel the spirit and changing mood at different Ghats and have glimpse of world’s most ancient surviving city. You will not find so much of differences and contrast at any one place of the world .It may be a kind of assault to your senses, but ultimately you’ll love it. SCENERIO AT THE GHATS Look below ,peoples taking bath ,some taking dive into the river ,peoples and priests ,performing rituals, offering ,water, milks, flowers to Maa Ganga (mother Gange) ,as they call it. Peoples sitting below bamboo strip made canopies, changing clothes, putting tilak on their forehead, taking blessings from priests, some chanting Har Har Gange, Jai Ma Gange. 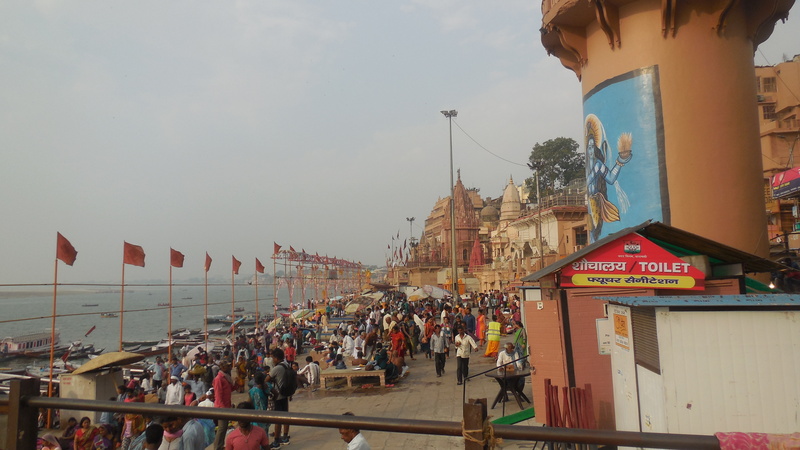 Walking along the Ghats, you may encounter masseurs, Sadhu’s, beggars, flower and spiritual article sellers, child flying kites, peoples washing clothes at some Ghats . At Harish Chandra Ghat and Manikarnika Ghats ,you may find, fumes rising from the pyres of burning dead bodies, their mourning relations (It is believed that those die in Varanasi and if their bodies are burned at these Ghats, will get Moksh (free from the tangle of life and death and will go to eternal heaven).A word of caution for these Ghats ,that keep silence and don’t do any kind of photography here. You may also encounter some wandering cows, pooing and peeing at places, but local people don’t mind it, because cow is supposed to be a sacred animal by Hindus. May be some guy urinating at some place. These are some of the down points but the administration has recently become aware about it and is going to take action ,to make these Ghats cleaner and free from animals. BEST TIME TO VISIT is early morning between 5 to 8 AM and in the evening between 5 to 7 PM, when you will watch a very unique and mind blowing event, GANGA ARTI .At this time many priest will pray to mother Ganga ,by offering multitier lamp ,incense ,flower water and fumes ,chanting Mantras with sounds of gong s ,which will end by blowing of Conch . BEST MONTHS to visit are from October to April- Avoid rainy season of July and Agust, because then Ghats are submerged under rain waters . To end with I can say that the experiences on the Banaras Ghats is very unique, second to none, spiritual, magical and unforgettable.